Skidmores Leather Cream: it cleans and allows the fibers to breath, the tanning oils and natural oils are replenished, makes leather soft and supple yet resistant to moisture. Skidmores Beeswax Waterproofing: Made with 100% pure beeswax. 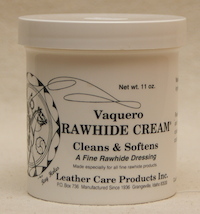 Vaquero Rawhide Cream: is formulated to give any fine rawhide product the nourishment it so badly needs to remain in a fine using condition. It is also excellent to clean and condition leather, Paso and English tack. **You can use this on leather but you should not use leather cream on rawhide. 11 oz. Bob makes these great bosal blocks to pre shape your bosal to the shape of a horses nose and jaw do you have proper contact and it doesn't rub raw spots especially under the jaw. 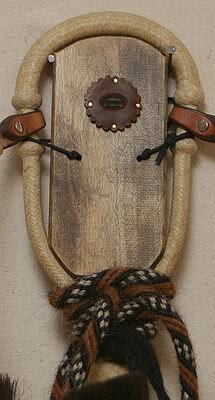 Also you can leave your mecate tied on if hung properly as long as you always store with bosal block tied tight to hold the shape. 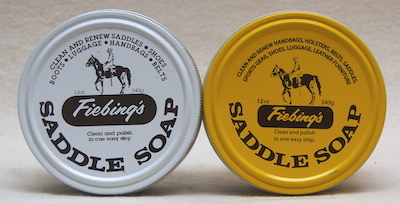 Fiebing’s Saddle Soap: clean and polish in one easy step. Cleans leather and lubricates the fibers to prevent brittleness...maintaining suppleness and strength.